You can book group study rooms at all of our libraries by clicking on the buttons below. There are 2 bookable study rooms in the Architecture and Design Library, Vivian Street. There are 3 bookable study rooms in Rutherford House on the ground floor. Bookable study rooms on floors five and six are now available in the Kelburn Library, Rankine Brown Building and on Level 1 of the Hub. If you wish to use AV viewing equipment, please book RB110 and ask for the room to be unlocked at Victoria Info Ihonui. There is one bookable study room on each level of the Law Library (excluding the ground floor), Old Government Building. 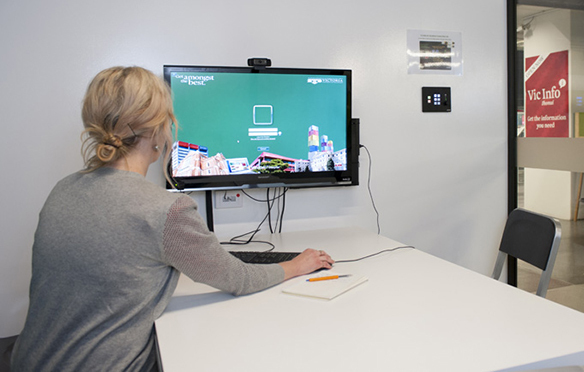 There are 4 bookable study rooms in the Language Learning Centre, level 0 of the Von Zedlitz building, Kelburn.